Derrius Guice is done for the season with a torn ACL. 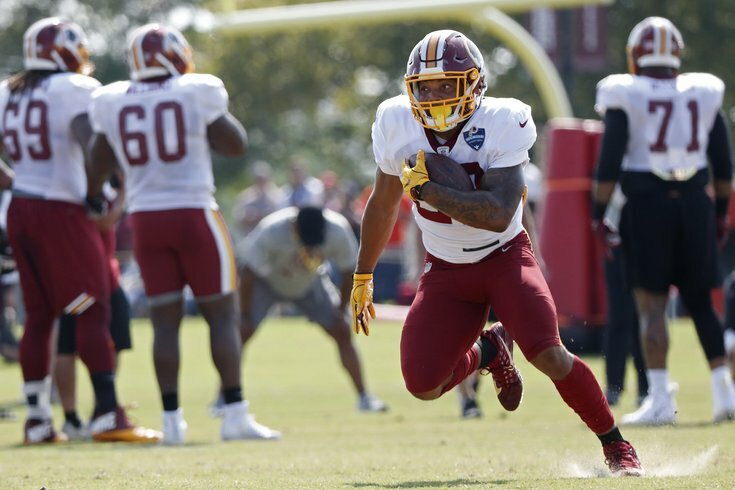 Washington Redskins running back Derrius Guice tore his ACL, and will miss the entirety of his rookie season, Kimberly Martin of The Washington Post reported on Friday. Leading up to the 2018 NFL Draft, Guice was a player commonly mocked to the Philadelphia Eagles, who were thought to be in the market for a running back. Instead, Guice was passed over by the Eagles and the rest of the league, likely due to what was considered to be at the time, “personality concerns.” He ended up being selected in the second round, 59th overall, by Washington. Guice averaged 7.8 yards per carry during his freshman and sophomore seasons at LSU. In his junior year, that dipped to 5.3 yards per carry, which was not nearly as impressive, though he battled through some injuries. In college, Guice was a violent runner with good cutting ability in the hole, as well as great balance and change of direction at top speed. In my view, he was the clear-cut No. 2 running back in the draft, talent-wise, behind only Saquon Barkley. This loss will sting the Redskins, a team with a good offensive line that previously lacked a quality early down back to run behind it. The Redskins hoped Guice would help significantly improve their 28th ranked rushing offense of a year ago, but they'll have to wait until next season to see any return on their investment in him. The Eagles play the Redskins Week 13 in Philly, and Week 17 in Maryland.